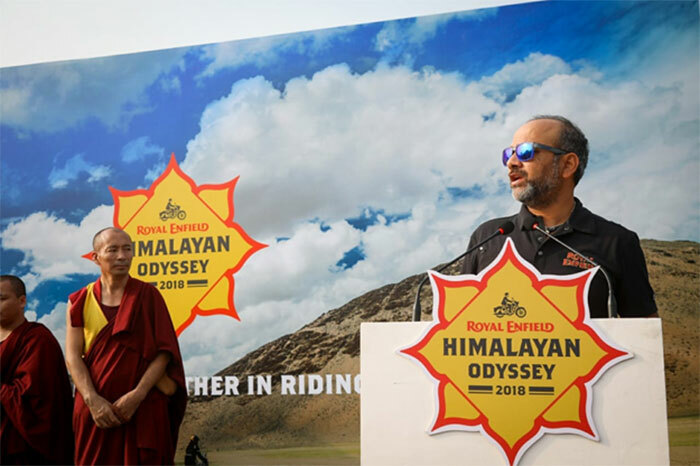 The 15th edition of Royal Enfield’s Himalayan Odyssey was flagged off today, from India Gate, the country’s most iconic landmark. Considered the holy grail of motorcycling, Himalayan Odyssey saw 60 motorcyclists including 10 women riders embark on a journey where they will be traversing some of the roughest terrains and highest mountain passes in the world, covering a distance of over 2200 kilometres in 18 days on their Royal Enfield motorcycles. The contingent was flagged off by Mr. Rudratej Singh, President, Royal Enfield. As a long standing tradition, the lamas chanted prayers and blessed the riders at the flag-off ceremony held at India Gate. Himalayan Odyssey is a testimony of Royal Enfield, which has for over 15 years been encouraging riders to do more with their motorcycles. The ride is symbolic of motivating others to make motorcycling a way of life. We are certain that the riders who have embarked on this journey ultimately come back as explorers because we are not just about motorcycles but pure motorcycling and exploration.